I recently returned from a few days of fishing in Western Maryland. The 125 Cfs flows on the North Branch of The Potomac tempted me to spend some days fishing on the WV/MD border. 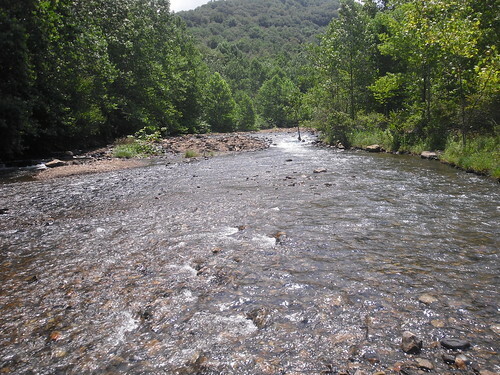 In these lower flows the wading is much easier, and the fish tend to congregate in the deeper areas. I fished around the Barnum access, and also hiked in many miles down river. On Monday I met up with Nate, a Backwater Angler regular, and we fished nymphs in the deeper slots. My Thingamabobber shot under in a deeper chute, and I was tight to a big rainbow. The trout looked like one of the big Freshwater Institute Rainbows stocked in previous years on the North Branch. At over twenty inches, and at least three pounds, this rainbow was a torpedo. The bow took off down river and forced me to chase it at least a hundred feet downriver, before finally breaking the tippet. An hour later I was tight to another big fish, but never saw it before it wrapped me up on a root system. I caught a few small bows, before we both stumbled onto a pool loaded with stocked browns. They had decent coloration, but the combination of beat up pectoral fins and eagerness to eat a fly was not typical of a wild trout. The ten to eleven inch browns were aggressive on hoppers, beetles and caddis patterns. The fishing was getting a bit ridiculous during the time we fished in the one pool, since the browns were so numerous. On Tuesday I fished a section of the North Branch many miles down stream of Barnum. I covered some shaded banks using a hopper, and caught a few rainbows. One of the bows was really vividly marked, and had all the traits of a wild fish. I also caught a six inch native brook trout, one of two I have ever caught in the North Branch. Hopefully in the coming years there will be more of these wild fish in the river. 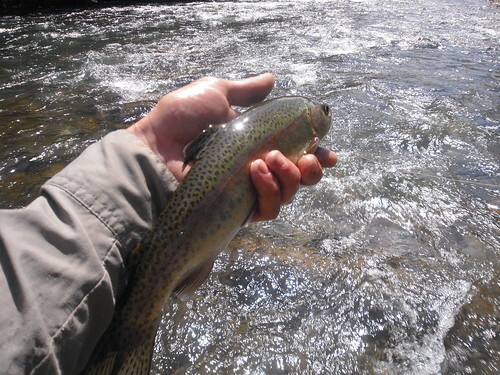 By the afternoon I switched to a big six inch long streamer and headed back down river. My hopes of finding an elusive big brown never worked out, but I caught some nice sized rainbows. I did get a couple of swipes from some decent sized browns, but none of the huge fish I’ve seen in the past. In the latest video post I filmed some river shots and fish. I also included a few minutes of casting and hook ups. The weather was hot, the fish were biting, and I saw two people fishing in two days on the North Branch. This entry was posted in fishing report, video on July 24, 2010 by Jason du Pont.